Price of 20 SBD / 20 USD: 7 World's Continents photo challenge WEEKLY WINNER announcement #50! Call to action: join our Twitter Initiative! Find out more HERE. I am very excited to announce the 50th weekly winner of my 7 World's Continents Photo Challenge that you have voted for over the past couple of weeks. The winner was based on your votes on daily winners announcements from each and every World Continent for that respective week. 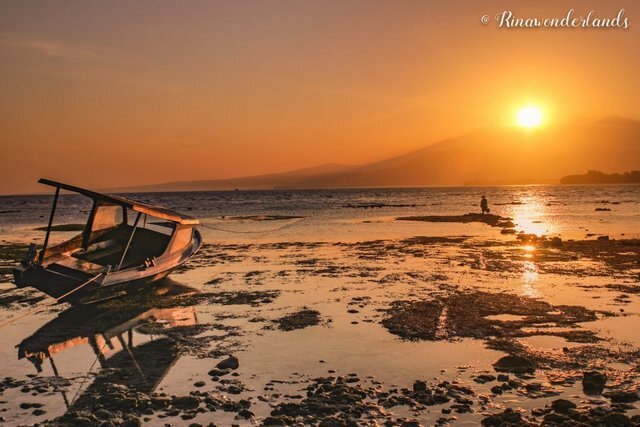 This is one of a beautiful sunrise i had when i was in Gili Trawangan island, a small island near Lombok. No cars, no bike is allowed in this island. But unfortunately we can't go visit the island for a while now, since the earthquake hit Lombok last month. Many building were damaged, and all the people were evacuated from the island for their safety. Her amazing picture received total upvotes from you in the amount of $16.67! Apart from my upvotes on one of her posts, I am sending 20 SBD to @rinawonderlands as the price for winning the weekly round. From here, her stunning picture from Indonesia automatically enters the second round where it will compete against the upcoming winners from the month of September for the price of 40 SBD. You can help @rinawonderlands to be the winner of the monthly round by upvoting this post in order not to only win 40 SBD but to also enter into the yearly challenge to compete against other winners of the upcoming monthly challenges to receive another 100 SBD for winning the whole competition. For more information about the 7 World’s Continents Photo Challenge and conditions see my original post: 200 SBD 7 World's Continents Photo Challenge - 2018 guidelines – 09/05 update. Please feel free to check out some of my other recent posts. 7 World's Continents Photo Challenge - week #50 - vote for your favorite picture of the week! ColorChallenge - Blue Friday - @andarago in 7 World's Continents Photo Challenge! Prague/Czech Republic - Friday photo challenge - share your personal pictures from your visit to the Czech Republic!